Lesro, Amherst Collection, Dimensions: 88.5"W x 23.5"D x 33"H. Seat Dimensions: 19.5"Wx18"Dx18.5"H. Weight: 77 lbs. 100% recycled fabric upholstery. Eco-friendly soy-based foam cushions. Solid hardwood frame. Weight capacity is 275 lbs per seat. Ships ready to assemble. Pricing and lead times may vary depending on fabric grade selections. Update the look of your reception area with the attractive Amherst Collection from Lesro. These striking chairs, benches, and tables boast Lesro"s exclusive tool-free assembly system and Matrex seat suspension for comfort that lasts. 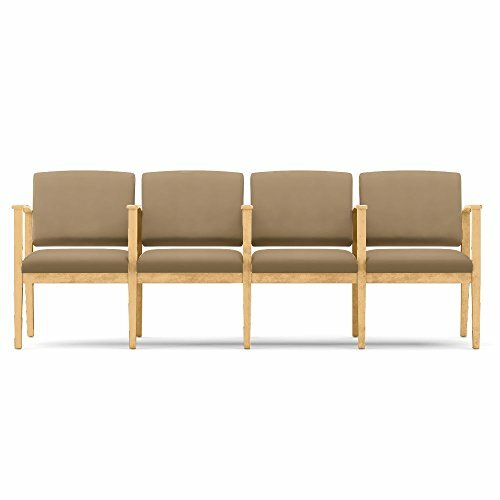 Anti-microbial vinyl upholstery makes this sofa with center arms perfect for healthcare settings. The padded back and seat, made of environmentally friendly Vitafoam soy-based foam, keep your guests comfortable during their visit. Open back design allows for easy cleaning. Weight capacity is 275 lbs per seat. Ships ready to assemble.